(Bloomberg) -- The city of Deer Park, Texas urged its 33,000 residents to stay indoors Thursday amid reports of elevated levels of the carcinogen benzene in the air. 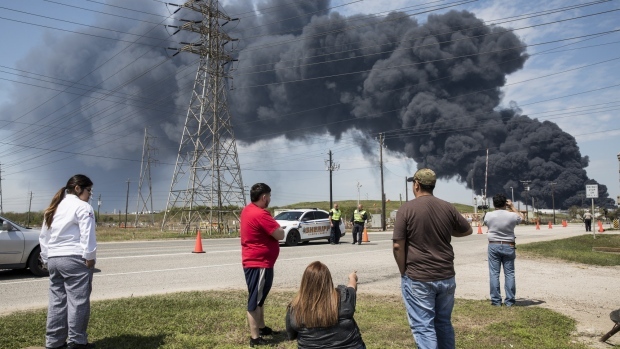 The shelter-in-place order, with police barricading roads in the city 18 miles (29 kilometers) east of Houston, comes after a brief flare-up overnight at a tank storage facility that had burned for four straight days earlier this week. Royal Dutch Shell Plc told workers at its 275,000 barrel-a-day Deer Park refinery to stay at home or remain inside the facility. The ITC tank farm in Deer Park began burning on Sunday and raged for four days, until the flames were extinguished. The facility holds as much as 13 million barrels of oil products and chemicals on the Houston Ship Channel. Plumes from the flames reached the city of Houston, where officials have said the smoke posed no risk to residents. Shell’s Deer Park refinery told workers to stay home Thursday or remain at the plant, according to a person familiar with operations. The refinery’s operations are normal, said Ray Fisher, a Shell spokesman. Part of State Highway 225, which many workers use to get to work at nearby refineries and terminals, has been shut down. Workers at LyondellBasell Industries NV’s Houston refinery continue to maintain and operate the facilities, according to Kimberly Windon, a company spokeswoman. Petrobras didn’t respond to an email seeking comment on the status of its Pasadena refinery.